For years, I watched at least one feature film everyday. I loved movies as a kid, but I only liked watching new releases. For some reason, I equated old with bad, and I wouldn’t even consider watching a movie in black and white. But if you want to write movies, you have to know your film history, so I made sure to watch all the great classics that I missed over the years. I went through all the best picture Oscar winners as well as films on lists like the AFI 100, the WGA 101, and the IMDb top-250. I sought out the best films and watched and re-watched them. If it was late at night, and I didn’t have time to watch an entire movie, I started it anyway and finished the rest the next day. I made the most of my time, rather than wasting it by watching mediocre TV shows just because “it’s on”. The most important resource for me was my public library system, which had DVDs of almost all of the great classic films, all for free, as long as you remember to return it on time. I love movie streaming services like Netflix, but the biggest problem is the lack of special features that you get on the DVDs and Blu-rays. I learned so much by watching the making of documentaries and listening to the director and/or screenwriter commentaries. But spending $20+ to buy a movie, especially when you are going to be watching hundreds and hundreds of them, will start to get quite expensive. Again, the public libraries were helpful. I’d take out DVDs of movies I’d already seen in the theater, just to watch the special features. When it came to more difficult to find indies or a favorite movie that I had to own, I bought used DVDs on Amazon for as cheap as $3 each. Most people don’t have access to be on film sets and witness the making of movies, but watching a documentary about the process is the next best thing. I checked out every screenwriting book in my local library, and I bought a few more on Amazon. Some of my favorites were Screenplay by Syd Field, Adventures in the Screen Trade by William Goldman, Rebel Without a Crew by Robert Rodriguez, Save the Cat by Blake Snyder, and Writing Movies for Fun and Profit by Robert Ben Garant and Thomas Lennon. I also scoured the internet for any screenwriting blog and website I could find. There is a ton of screenwriting content available online, completely free. The information from those books and blogs were crucial at first, but again, once you’ve learned the basics of the craft, I find it’s better to forget all that stuff when you’re actually writing your screenplay. For me, the things I learned are ingrained into my subconscious, so I’m not distracted by nitty-gritty details like act breaks and beat sheets, and I can focus solely on the story and the characters. 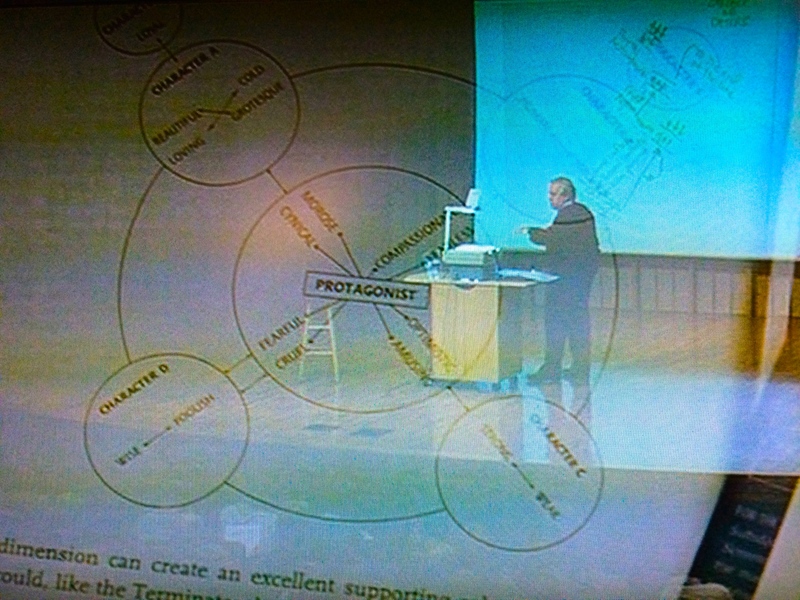 When I watch a movie, I turn off my analytical screenwriter’s mind, and sit back to enjoy it. It’s not until after that I start to think about the film critically. Go to the IMDb page for any movie, click on the critics reviews, and there are hundreds of links to free reviews to read. I made it a ritual to read Roger Ebert’s review immediately after watching a movie. It was rare that I found a film that Ebert didn’t have a review of on his website, rogerebert.com. It was equally rare that I found myself disagreeing with his opinions. Other reviewers I enjoy are James Berardinelli at Reelviews.net, and the Slashfilm podcast. Sadly, after Ebert’s passing, there will be no more new reviews from him, but there are still thousands of older films from the archives that I’ve yet to see, and when I do, the first thing I’ll do afterward is read Ebert’s review. The second thing I do after watching a film is search the internet for interviews with the screenwriter and/or director. There’s nobody better to learn screenwriting from than the people who are currently doing it professionally. In the past, screenwriters were mostly unknown, but with the proliferation of film news websites and blogs these days, in depth interviews with screenwriters are becoming more and more common. Personally, I prefer podcast interviews so I can hear the writer speak directly and unedited. My favorite sources are the Creative Screenwriting podcast (now The Q and A with Jeff Goldsmith), The Treatment with Elvis Mitchell, and Scriptnotes with John August and Craig Mazin. I subscribed to every podcast screenwriting-related, of which there are more and more of everyday— all free. You can read and listen and watch things about screenwriting, but the only way to truly learn how to write a screenplay is to sit down and write a screenplay. Then rewrite it. Then write another screenplay. Then another. The more you write, the better you’ll write. A lot of the screenwriters I learned from warned that your first screenplay won’t be any good, but I didn’t believe them. As I wrote my first screenplay, I thought it was amazing. Now looking back years later, I can see that they were correct. It’s important to think what you’re writing is excellent while your writing it, but it’s even more important to be able to look back when you’re done and see the flaws in your script in order to fix them. That’s easier said than done, but you can only get there by writing. The best thing about writing is it is completely free. You don’t need to go out and buy expensive screenwriting software like Final Draft. There is free software like Celtx and Writer Duet, or you can simply write in a word processor in John August’s Fountain format. Or you can go really old school and write on pen and paper. It doesn’t matter where or how you write— just write. This entry was posted in Screenwriting and tagged Blake Synder, Celtx, DVD, Elvis Mitchell, Final Draft, Fountain, IMDb, James Berardinelli, Jeff Goldsmith, John August, Netflix, Robert Rodriguez, Roger Ebert, screenwriting, Scriptnotes, Slashfilm, Syd Field, William Goldman, Writer Duet, writing on October 29, 2014 by T.Z. Barry.